Unite the union has launched a strike fund appeal to support workers at Wishaw & District Housing Association. Today (Wednesday 30 November) Unite members at the housing association started a further four days of strikes, with action also taking place on Thursday 1, Friday 2 and Monday 5 December. This follows eight previous days of strike action since September see our report here. Once again, Unite LE1111 houisng workers branch sends solidarity. The housing association wants to slash four days’ holiday a year from the staff and to increase their working week by 30 minutes – the equivalent of four additional working days a year. 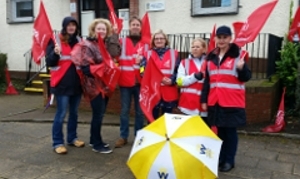 Unite says this is the latest in a series of attacks on the pay and conditions of workers at Wishaw Housing Association. 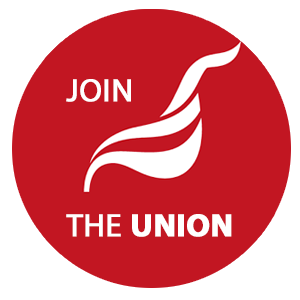 Unite regional officer Gordon Casey said: “We are asking all our branches in Scotland to contribute to the Wishaw strike fund – including all our branches throughout the housing association sector. The union is determined that our members at Wishaw get all the support they need in their fight for fair conditions. “Our message to the housing association board is that this dispute will not simply go away. I make an offer here and now to sit down with them to discuss how we can move forward, so that our members can go back to what they do best – working hard every day for the benefit of tenants and the wider community in Wishaw. “On behalf of our members, I’d also like to once again thank the people of Wishaw for their support, especially those who are tenants of the housing association. It has been overwhelming, and very much appreciated. Unite says that over the last three years its members at Wishaw & District Housing Association have accepted their pensions being massively reduced, their wages being cut, their bereavement leave being reduced almost by half, and lunchtime opening to provide a better service to tenants. Some 14 Unite members at the association are involved in the dispute, including housing officers, senior staff customer services assistants, cleaners, maintenance assistants, and accounts assistants. All of the members voted to support industrial action in a ballot in August.